At Fleet Feet Sports Madison and Sun Prairie, we like to get to know our customers. Everyone who walks into the store has an amazing story. This week we sat down with Julia Zella to get her story after her return from Tampa Bay, FL with the Fleet Feet Destination Training group. Julia completed the Gasparilla Distance Challenge; a 5k, 8k, 15k and a half marathon. That is more than 30 miles in one weekend. Fleet Feet Sports: Welcome home. You look tan and refreshed. How was the Gasparilla weekend? Are you recovered? Julia: It was amazing. Well, I’m recovered, but I just returned home late last night from a business trip out East. I returned from Tampa on Monday and flew out on Tuesday and the storms in Chicago delayed my return. But I’m home and recovered. I’m going to yoga after this interview! Fleet Feet Sports: So tell me about the weekend. 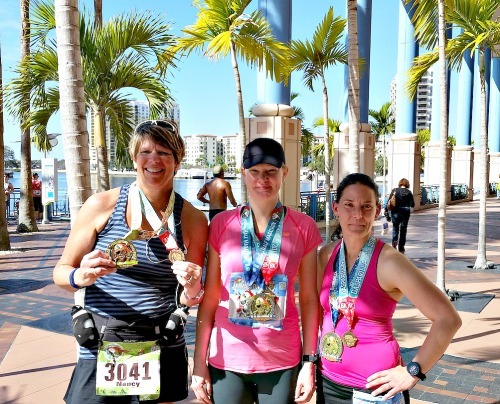 What races did you do in Tampa? Julia: I did the whole challenge; a 5k and 15K on Saturday and a half marathon and 8k on Sunday. I decided if I was going to go all the way to Tampa and do the Half Marathon, I might as well do the entire challenge. Basically, GO BIG or GO HOME! Fleet Feet Sports: Great motto. I am so impressed. How did it go? Julia: It was perfect. The weather was beautiful, starting in the fifties and ending the races in the sixties. Everything was organized well. We were done racing each day by 10am, so we had the rest of the day to relax and recover. The most difficult part was running the final 8k race an hour after the half marathon. Everything was great. Fleet Feet Sports: How did you decided to join the Fleet Feet Destination Training program? Julia: The destination run to Tampa was my first-ever Fleet Feet Sports training program. I signed up hoping it would help me run through the winter season. And it did! I’ve also signed up for FOO training group to train for the Cellcom Green Bay Marathon! And I definitely want to do the Destination Training group again next year. Fleet Feet Sports: Have you always been a runner? Julia: I tried cross-country in high school but it didn’t take. Then I gave it another go in 2013 and it stuck. Fleet Feet Sports: I’m glad it stuck. Since you are new again to running, do you have a word of advice for new runners? Julia: Aside from investing in really good running socks? :) Sign up for a local race and catch the fever. There is a place in this sport for people of all shapes, ages, abilities, and goals. Fleet Feet Sports: Great advice. Why do you like Fleet Feet Training programs? Julia: I’ve met some really great people and experienced some new routes I wouldn’t have tried on my own. It was inspiring to race with a group in Tampa. I’m looking forward to trying out FOO and working with others to get those really long runs done. Fleet Feet Sports: Speaking of routes, where is your favorite place(s) to run? Julia: The trails in Madison are great. I also really love running in the town where I live (Horicon). The trails around the Horicon Marsh lend themselves to some very peaceful runs. Fleet Feet Sports: So everyone has a story, just curious why you run? Julia: I started running to improve my health. I continue to run because I want to keep getting better. It’s a personal experience, but one I can also share with my husband and the friends I’ve met through running. I’d love to be able to say that every run is zen and my knee never hurts, but that’s unrealistic. The sum of running for me is positive and I hope I can continue to do this for a very long time. Fleet Feet Sports: I love that you can admit you aren’t always pain-free. I think most people want that all the time. So what is your favorite running memory or ‘zen’ moment? Julia: Last summer, I was out on an early morning solo run near the Horicon Marsh and a doe and two fawns came out of the fields and ran near me for a while. That’s one of my favorite parts of running…experiencing moments that I would have missed had I just stayed in bed. Fleet Feet Sports: Any embarrassing moments while running you want to share? Thanks to Julia for taking the time to share her story with us. 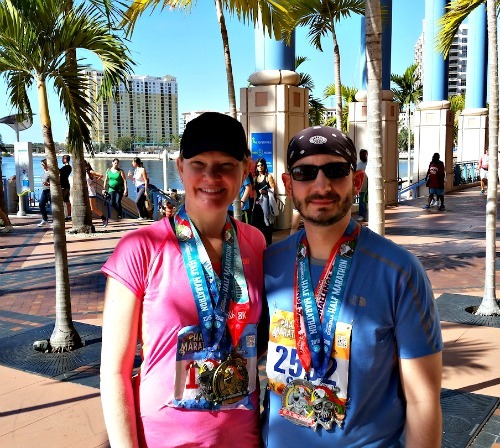 And congratulations to her and her husband Curtis for their Gasparilla accomplishment. We look forward to seeing them both at the Force of Orange Training workouts.